Home / Articles / Be Different, Study in China! Did you know there’s a Nottingham in China?! 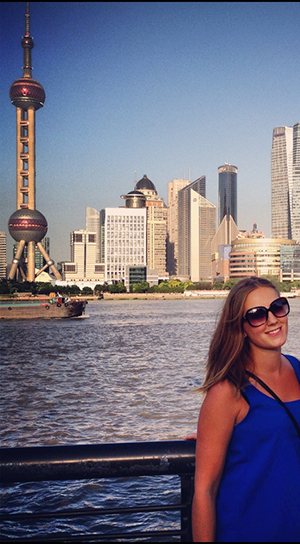 I’m Emmie from Sweden, now studying at The University of Nottingham Ningbo China. I knew I wanted to do my masters abroad and I wanted it to study in an up-and-coming place. One of my requirements was that I wanted a university with a high ranking and good reputation. Coming from Sweden where my study is all funded, I knew that if I was going to pay a tuition fee I wanted to have good value for money. When I found out The University of Nottingham (UK) has a campus in Ningbo China, I was really interested as it ticked my boxes; a good reputation, a top 100 university in the world and in China, the place to be! When reading more about the university found the course I was interested in ‘MSc International Management’. The module outline was perfect offering optional modules and flexibility for me to choose modules in-line with my interests. Online you can also read about the tutors for each division, doing my background research I knew before arriving to China that my tutors would be an international mix and with world class research. The most important thing that made my decision was that at Nottingham’s China Campus, even though I would study in China, my degree would be fully taught in English and I would get the same British degree certificate as I would if studying in the UK. Great! So what’s China really like? China for me was foreign, isn’t it the place where people grow rice, talk and write an alien language and eat strange things like grilled cockroaches? Well yes… but there’s so much more to it! People used to travel west to find gold in U.S.A, now you go east to do business. China is the new world economy, with its global hub in Shanghai, which is only 1hr 40mins train away from Ningbo where the university is. It’s nice and handy for a short weekend away! I thought it would be small. Wrong. It’s huge (7 million people)! I thought it would be very Chinese. Half wrong. It’s very modern and both Chinese and Western. Ningbo is by far the most developed city I’ve lived in, full of skyscrapers, international brands like IKEA, H&M, Zara, Disney and Marks & Spencer etc. My first impression of the campus was great as I arrived on a sunny day, the British influence of the buildings along with the well-kept gardens made me feel safe. The campus is conveniently placed in the south of the city called Yinzhou, an area that they only started to build ten years ago. The campus is very green and quiet and it’s a gated area which I think is important when moving to a country you don’t know much about. I have loved every minute of my studies so far, the teachers and students are all very down to earth and sociable, it’s easy to make friends and the University are offering activities outside the classroom to make the student life experience to the better, such as societies, sports and free Chinese lessons. There are students from nearly 60 different countries and I now have friends from Europe, South America, Africa, US and Asia! Even a local film company wanted to come and talk to us! For my future career path I would like to work in an international business on a management level. Knowing how important business in China is today and how it will keep developing in the future, I know that I am in the right place at the right time. My masters will not only prepare me for my future career but it will also act as a reference and proof of a lifelong investment I have made in myself.